NYAPRS Releases Executive Seminar Program, Registration Details! 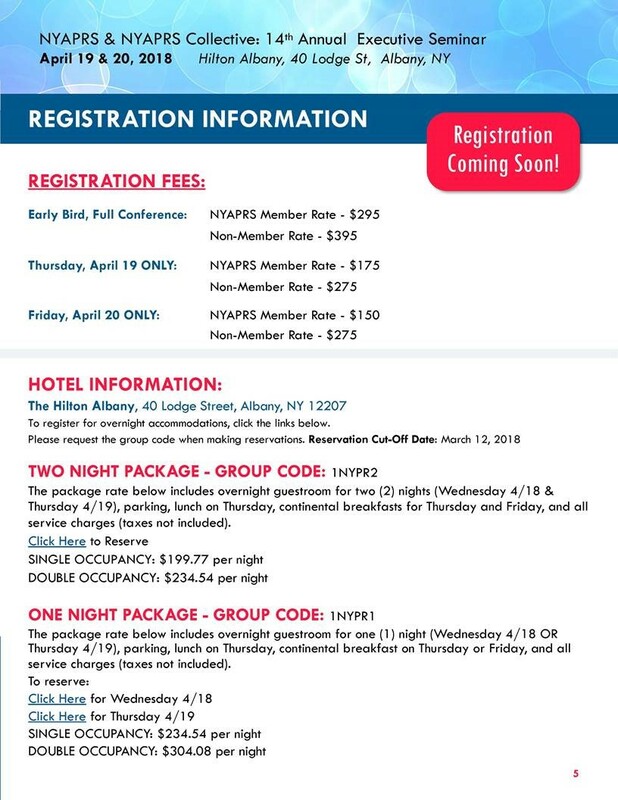 NYAPRS is very pleased to release program and registration details for our upcoming April 19-20th Annual Executive Seminar in Albany! This year’s program focuses on examining new partnerships and strategies to successfully engage and support people with the most extensive behavioral health, medical and social challenges that have in recent years become top national and NYS priorities. 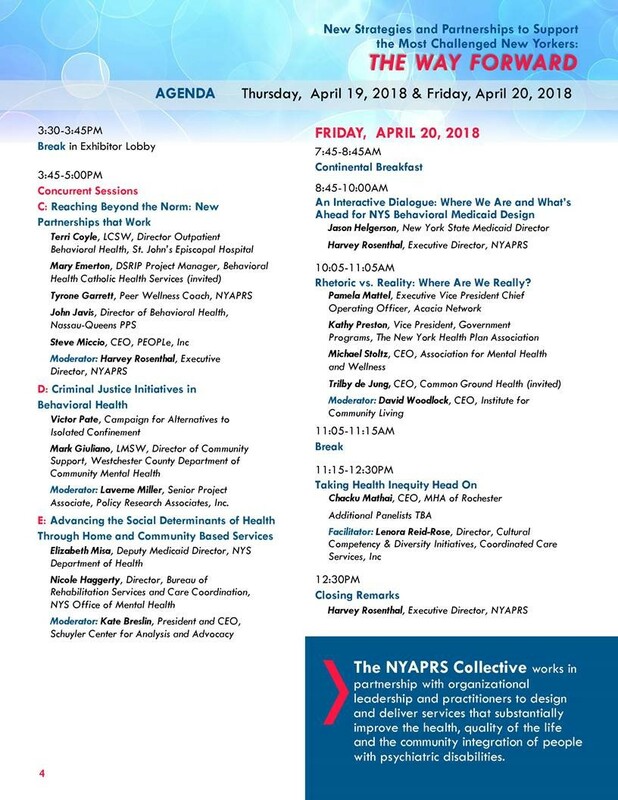 On the national front, our program will kick off with welcome remarks from NYS Deputy Secretary for Health Paul Francis and a keynote address by the nation’s first ever HHS Assistant Secretary for Mental Health and Substance Use Dr. Elinore McCance-Katz with a reaction panel that includes consumer and family members of the new federal Interdepartmental Serious Mental Illness Coordinating Committee, NYAPRS new policy director Elena Kravitz and well know advocate and author Pete Early. The panel also includes national provider advocate Rebecca Farley from the National Council, rights advocate Jennifer Mathis from the Bazelon Center for Mental Health Law and NYCDOHMH Bureau of Mental Health’s medical director Dr. Pablo Sadler. We’ll then hear from a NYS based panel that will look at what we’re doing on the ground to support this group that will be followed by sessions on Peer Services, Addiction Recovery Supports featuring former SAMHSA advisor Tom Coderre, DSRIP innovations, Criminal Justice initiatives and the Social Determinants of Health. Friday will feature an informal discussion with NYS Medicaid Director Jason Helgerson, a reaction panel and a plenary session on Strategies to Take on Health Inequity. See program schedule at 2018 Brochure OR https://static1.squarespace.com/static/58739f64e6f2e14a3527a002/t/5a871315e4966bc89503f246/1518801688963/Executive+Seminar+Brochure+2018.pdf, via the attachment or below.